Have you ever held a 2,200-year-old coin in your hands? Just in time for the holidays, ASI is releasing a limited quantity of an ancient silver coin worth adding to any rare coin collection. The Victoriatus is a tangible link to one of the most important eras of Ancient Roman History, and we are offering you the unique opportunity to bring one home for the holidays. The silver Victoriatus coin’s name comes from its unique design. One side shows a winged figure representing Victory placing a wreath over a military trophy, crowning a cache of captured weapons and armor. The obverse side is imprinted with the face of the Roman god Jupiter. These images were meant to inspire hope for Roman victory during wartime. The Victoriatus dates back to the late third century BCE during the Second Punic War, also known as “The Hannibalic War”, when the Roman Republic battled Hannibal’s Carthaginian Army. The silver Victoriatus was issued between 211 and 208 BCE, just as the Carthaginians’ stronghold was ending, and the Roman state acquired access to a great amount of silver. Although the silver Denarius was issued around the same time, the Victoriatus is more debased and quite uncommon. 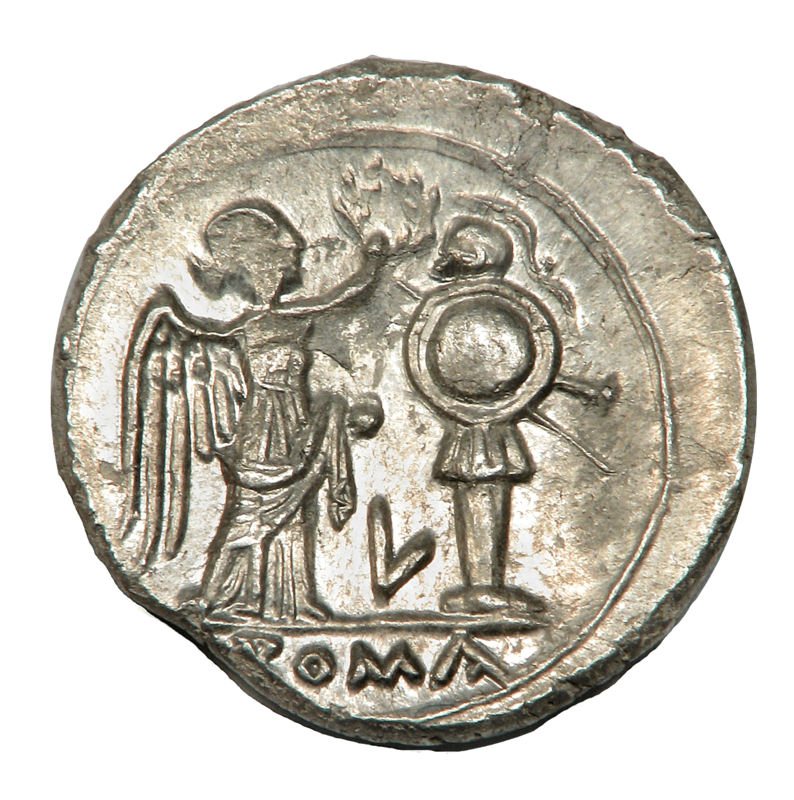 These coins, and other silver coinage of varying denominations, helped the Roman Republic to finance the war after years of depleted resources. The Victoriatus originally weighed about 3.4 grams and was struck by hand, meaning no two are exactly alike. Each of these special coins has been certified by NGC, and comes housed in a museum-grade story vault holder to preserve the coin detail and value, along with a description and depiction of the historical events that led to their creation. Ancient currency is rare, numismatically interesting, visually appealing, and has a fascinating accompanying history. These coins are valued for their rarity as well as their precious metal content, and because of their unique and ancient origin, the supply is limited. Our ancient coin experts hand-pick the pieces with the most phenomenal potential - high quality, rare examples with exceptional eye appeal. 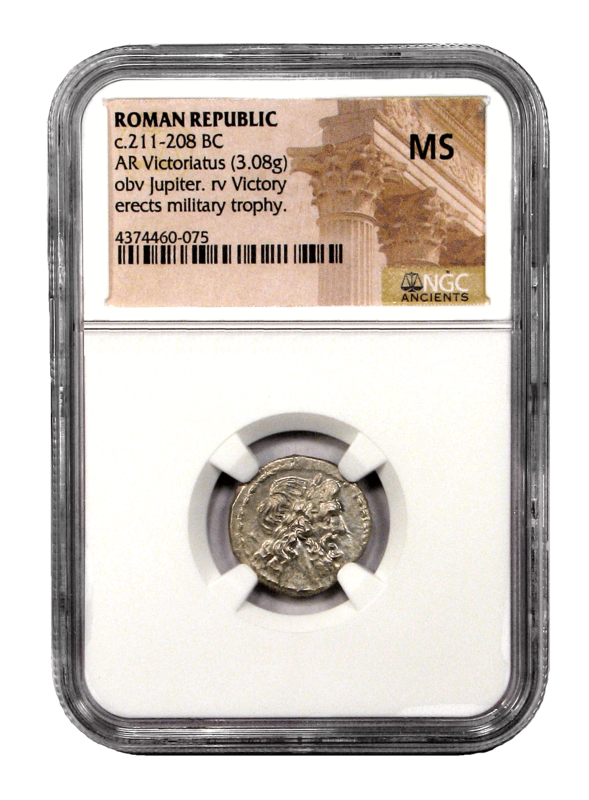 Ancient coins enjoy a truly expanding market demand worldwide and an ever-decreasing supply, which makes the Victoriatus a truly unique holiday gift for your collection, or a fantastic way to introduce a treasured family member or friend to the world of rare coin collecting. This sliver of history can be yours for $799 per coin with shipping, handling, and insurance included in that price, or just $749 with the purchase of three (3) or more*. So, please call us at 800-831-0007 or email us to secure yours today while our supply lasts. *Prices subject to change based on market fluctuation and product availability. Prices reflected are for cash, check, or bank wire. Free shipping, handling, and insurance are available for any quantity ordered. Order must be placed by 5 pm EST on December 7th to ensure delivery by Christmas. Offer expires Friday, December 7th, 2018, or while supplies last.